Defender Josie Baca takes possession of the ball from Sacramento City College players. The American River College women’s soccer team defeated Sacramento City College on Friday Oct. 5 in a highly competitive game that resulted in a score of 9-0. ARC began the first half with great ball movement and good passing, defender Josie Baca and midfielder Kistia Pelayo are two players who did a great job of passing, according to their teammates. ARC and Sacramento City players both actively communicated with each other on the field during the first half, as well as both teams’ bench. However, ARC swas not spreading out well along the field, not covering potential defensive weak points and leaving themselves open to Sacramento City stealing the ball. Sacramento City proactively strategized their placement on the field while ARC wasn’t getting to the ball fast enough due to Sacramento City’s defense. ARC forward Halle Powe and midfielder Tanya Rodriguez skillfully stayed on Sacramento City players and were continuously physical throughout the game. 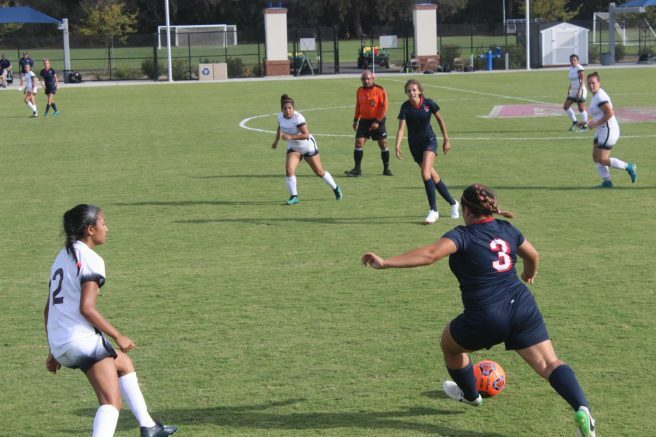 ARC kept its momentum going and regained control of the game by spreading out along the field more efficiently to score the first goal of the game from forward Savannah Tijerino-Santos, 19 minutes into the first half. ARC defender Kerri Hilderbrandt sustained an injury in the first half and was escorted off the field. ARC trekked on after the teammate’s injury and consistently moved the ball and played strategic defense, maintaining the positive attitude they began the game with. “I agree that we had a positive attitude going into [this game]. As a team we were pressing together and making sure we won our battles,” said ARC defender Averi Roberts. Sacramento City continued trying to corner ARC players toward the outside of field in defensive attempts to get themselves closer to the goal to score. Sacramento City also didn’t pay attention and left a large amount of room for ARC to possibly score a goal. Towards the end of the first half, ARC scored three more goals, two again from forward Tijerino-Santos, giving her a hat trick, and one from forward Mia Jaraba. In the second half, ARC dominated the rest of the game and continued the use of the same defensive and offensive schemes throughout the game. Sacramento City became lazy towards the end of the second half with its defense grouped together on the field instead of spreading apart. ARC forwards Jaraba and Mairenn Atkinson both scored two goals as well as midfielder Hildelice Medina who scored one goal to finish the game with a total of nine goals. Overall, the team worked well together in this game and that worked in its favor. “I think being prepared [helped us with this game], yesterday at practice we were really running through the same drills that we did today for our game so that put in perspective the expectations,” Rodriguez said. Be the first to comment on "Beavers rally together for a 9-0 win over Sacramento City"